Even those who have never been to Thailand are well aware that local temples are spectacular and definitely worth visiting. TripAdvisor and similar sites put them high on the list of the Kingdom’s most popular attractions, along with nature and cuisine. The riverbank has many sculptures. Sad to say, a first-time tourist to Thailand hardly ever goes beyond the standard temple programme, and thus, doesn’t learn the most interesting thing about this part of Thai culture. Having visited Wat Chalong in Phuket or Wat Pho in Bangkok, a tourist mistakenly presumes that now he or she has seen them all, while nothing can be further from the truth. All Thai temples are different and each has it’s own unique features. First, wat architecture in Thailand has seen many changes in the course of history. Second, over the centuries Thai culture has incorporated significant influence from India, China, Cambodia, and the rest of Southeast Asia. Some temples like Wat Sothon Wararam Worawihan have subtle traces of European influence in their architecture. Others, like Wat Pranang San in Phuket surprise with statues of guardian Yaks – mythical Thai giants, armed with assault rifles. Still others have images of Buddha neighbouring deities which are normally associated with other religions. Located in Chachoengsao province, Wat Saman Rattanaram is exactly the place where you can see Hindu deities highly respected by Thais. This temple sits on an island surrounded by waters of Bang Pakong River from every side, but you will hardly notice it unless you have a flying drone with a camera. Wat Saman Rattanaram is known as home to Thailand’s largest image of Ganesha, the elephant headed deity of the Hindu pantheon. He reclines on a pedestal on the river bank, impressing visitors with his size (16 metres tall, 22 metres long) and colour. 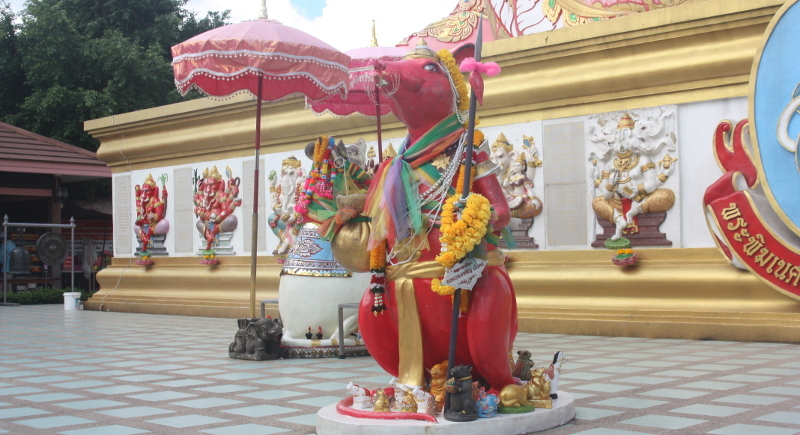 Ganesha at Wat Saman Rattanaram is bright pink, creating a miraculous visual against a backdrop of a clear blue sky. In Ganesha’s many hands, he holds a broken tusk in one hand, a lotus flower in another. Another hand rests on his leg and a fourth is poised with his arm draped over a reclining pillow. His pedestal is decorated all around with other images of himself. There are images of other Hindu deities at Wat Saman Rattanaram and all of them are impressive. 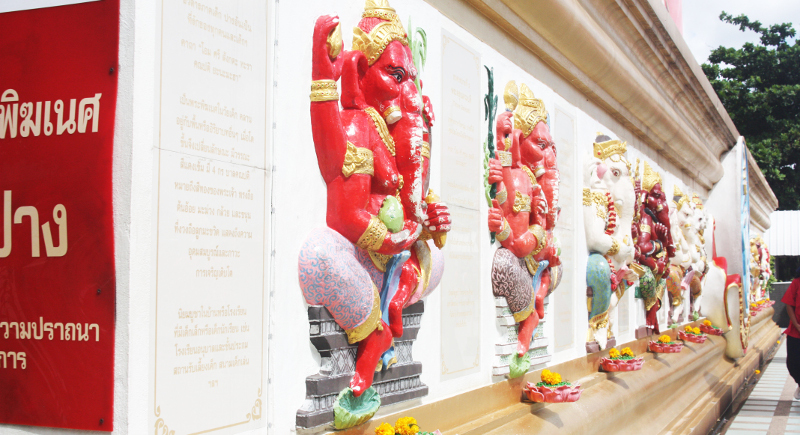 Next to Ganesha one can find the four-faced Phra Phrom, which is the Thai representation of the deva Brahma. Not far away is a giant sculpture of Indra sitting on the back of his elephant Erawan and Phra Rahu, the master of eclipses. 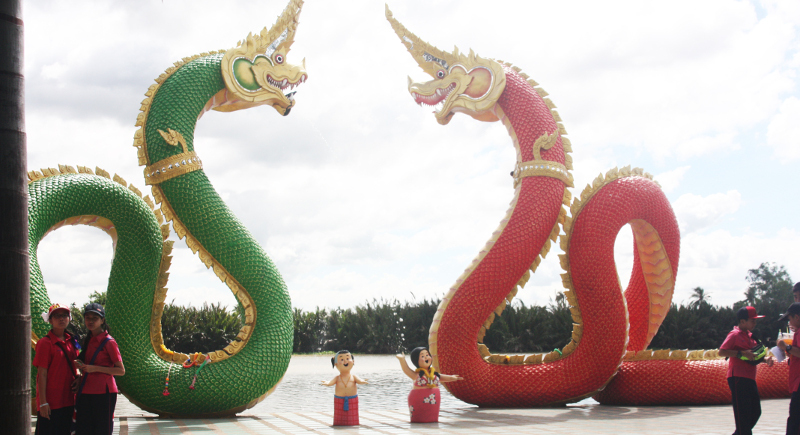 You can also find two Naga serpents by the river’s bank and among other sculptures. Wish I had some expertise in Hinduism and Buddhism accompanying me on my visit to Wat Saman Rattanaram for deeper insight. Unfortunately, I can only hope to name a few of the deities correctly and escape divine anger. As for the sculptures I loved most, these were the rats surrounding Ganesha’s pedestal. Each of them is as tall as a full-grown man and holds a spear and a bag. The rats may be more than just guards; well, I saw Thai worshippers approaching them and whispering something in the rats’ ears after praying. I’m not sure if the rats fulfil wishes but you can give it a try. Regarding wishes, I cannot help mentioning that the temple is big enough to spend an hour or two exploring and in hot weather this can be challenging. If so, fill free to refresh in the air-conditioned Amazon café or replenish lost calories with some food from the local floating market. Souvenirs and gifts are also available for those wishing to get something for better memories. 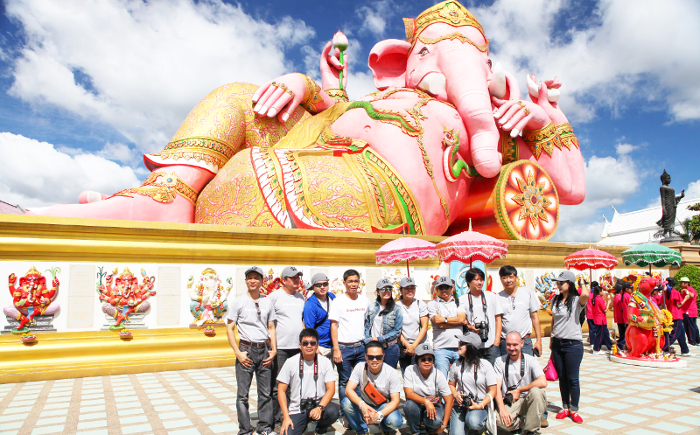 Wat Saman Rattanaram is located in Tambon Bang Kaeo, Chachoengsao province, approximately 50km east of Bangkok. The location on Google Maps is accurate, so feel free to Google for directions. The temple is open from 9am-5pm. More information is at www.watsaman56.com.